These pictures were taken in Norway, somewhere near the Arctic, where my son and his family went on a visit recently. The photographer, I feel, has done a very good job. Extra credit especially for capturing my son and his wife who hardly ever pose for pictures. This very young photographer, of whom I am so proud, is my little granddaughter Arundati. Raj Thackeray, Maharashtra Nav Nirman Sena (MNS) leader, has become the self-appointed censor of films. Says today’s Hindu: He has “threatened to “censor” every film released from now on to ensure that it uses Mumbai and not Bombay or ‘Bambai’ to describe the city.” This is the most important thing that a person who cares about the city can think of, apart from bashing up people whom he deems outsiders, and insisting on the imposition of the local language at all levels everywhere. This obssession of politicians with films is frighteningly on the rise. Where do they find the time? Tamilnadu sets the pace, and is a monumental example of folly to others. The Tamilnadu CM has assured that films with Thamizh titles will get tax benefits. The race for thinking up newer titles is hotting up. Our CM has time to make regular appearances at events of supreme significance like audio releases of forthcoming movies, where sops like this are announced. He even has arranged for TV sets to reach every single home, keeping his election promise, so that they can see all the movies with Thamizh titles in the comfort of their homes – maybe free cable connections and DVD players will be gifted before the next election. Is the Election commission watching, or caring? Who cares that there is not enough electricity in the state? (Maharashtra has four hours power cut now – once upon a time its Electricity Department, BEST, lived up to its name; and Tamilnadu has recently introduced hourly power cuts). Or coming down to basics, no proper sanitation? Setting up bathrooms and toilets in their homes would be far more beneficial to them. I say, assure the children of a hygienic home and good education, not provide them with the means to a descent into dissipation. There are schools in parts of the state without even blackboards. Does anyone care? Movies and movie persons, however need to be given full support at all times from the government. Families of yesteryear’s film folks are generously helped by the government so that they need not earn their own living, but bask in the vicarious glory of their long deceased cinematic relatives. It makes me sad that nobody has ever thought of the indigent families of unglamorous schoolmasters, or farmers who can’t make enough to repay their loans. 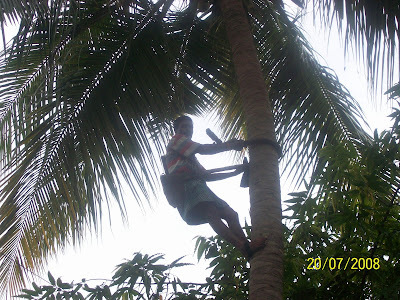 Climbing the coconut palm is a skill fraught with risks - but there is no other way of getting the coconuts down from the high palms soaring up to the skies. And we do need the special help of men who are experienced in this - unlike plucking strawberries. It is highly unlikely that aiming a couple of stones at nuts will bring them down, as one can with mangoes. There are men who do this for a living, charging you by the tree. We have a couple of palms in our front garden (euphemism, because we don’t really have much there), and periodically one of these men come to pluck down the nuts. One of them was a Thamizh litterateur, and could quote Thamizh verses by the metre, many of them his own. All he wanted was to give his daughter a good education. Another one just wanted to make money for his daily drink – if he had enough for the day, he was not going to climb anymore. This time a person called Ezhumalai, who was skilful,quick and also arrogant, came. 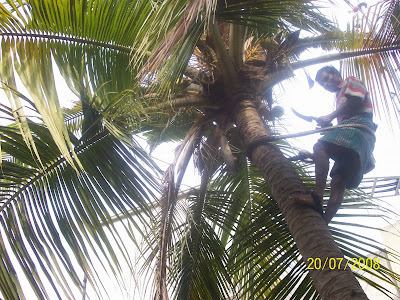 He well knew his worth, as men climbing coconut palms are hard to come by. I read last year that Kerala, where there is a profusion of coconut palms, had an acute shortage of climbers, and the government was going to train men to climb the palms.Ezhumalai however learnt his trade from his grandfather, he said, near Thiruvannamalai, where he grew up. 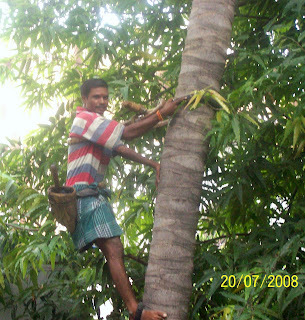 He has been in the city for the last 20 years, climbing palms and earning a living. curved aruval to clean up the dried and drying fronds. And in a matter of minutes, they are done, and slide down the palm. The palm trees are said to be benevolent, and never shed either frond or fruit if someone is in the vicinity for fear of hurting them. And a nut falling on one’s head from that height can be, as one can imagine,quite dangerous. Each and every part of the palm has some use or the other. 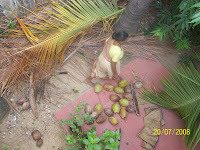 Apart from the edible parts of the nut, the husk is made into coir, a thick strong rope. The leaves are used for thatching and the dried stems bunched together end up as brooms. The trunks, I understand are used to make bridges, valued for their straightness. Ezhumalai caught me taking his pictures, and telling me to save him a copy walked off, his work done. What does a mem sahib in the tea gardens (estate) of West Bengal and Assam do when she is not serving tea and delicate snacks to visitors? 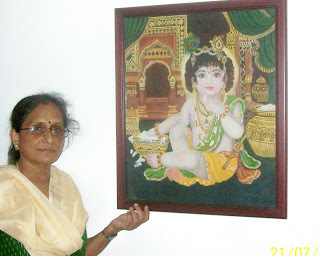 Sakunthala Varadarajan, generally known as Gita, took to painting. “I never knew I had it in me,” says this artist, who now resides in Alwarpet, after her husband retired from the tea industry. 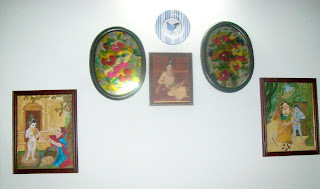 Her drawing room is testimony to her artistic skills, where her oils jostle for space with her Tanjore paintings on the walls. 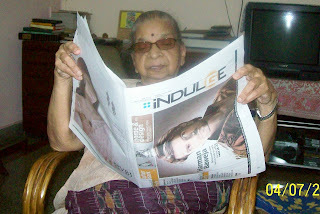 “Leisure is the life style in the tea gardens, a reminder of the colonial days,” says Sakunthala. 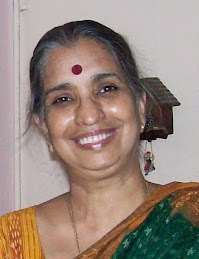 “I had an army of servants to help me run the huge house, and had a lot of time to spare, especially with my husband going off on tours.” When her daughter was younger, Sakunthala used to spend a lot of time in Chennai with her, taking care of her education. But later when she grew up and left for the USA, she spent most of the time in the garden. “I missed my daughter a lot, especially after she got married, and was nearly going off into a depression,” she says. “That is when I took up painting, in 2003. I surprised myself with my skills.” She adds modestly that she is not an inspired artist, but can paint portraits of people and still life. “I make good copies of photographs and other paintings,” she says. Her latest endeavour is greeting cards with interesting pictures done in acrylic on the outside and blank space on the inside, so people can write their own personal messages. 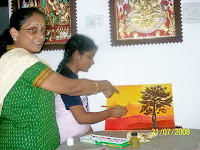 She paints for a couple of hours everyday. “I would now like to share my gift with others,” she says. 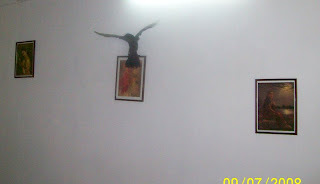 So if you are an aspiring painter, you may contact Sakunthala at 2, Lava Kucha Apartments, C. V. Raman Road, Alwarpet. Ph. 42030307. 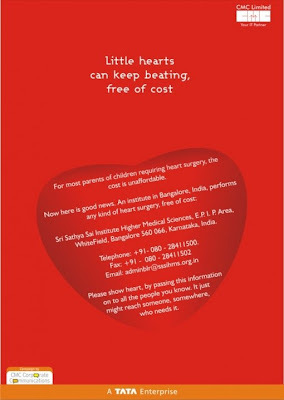 This article (minus pictures) appeared in a recent issue of 'Mylapore Times', our neighbourhood newspaper. The upshot was that many people called Gita, (nearly thirty, she says) to enquire about the paintings and lessons, and she has started lessons with some students. The neighbourhood newspaper efficaciously highlights local people and events. 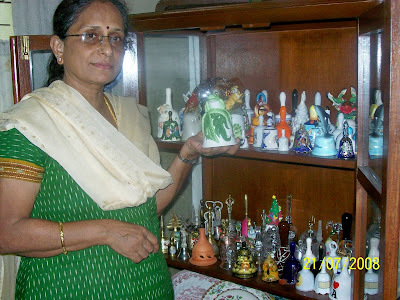 Gita is a collector of objets d’art as well; and she has a remarkable collection of bells. It was a strange visit. 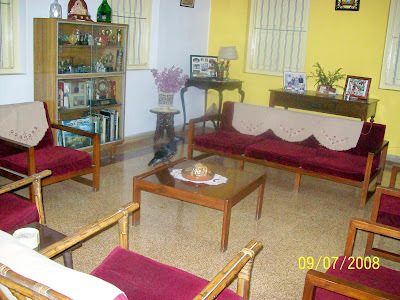 He just walked in from the open door from the balcony, head cocked, and tottered on his two clawed feet right up to the centre of the room, and hopped on to the low table there, while we watched mouth agape. Our helper felt that the crow should not sit there, and switched on the light to shoo him away. He got irritated and flew up to the wall. He really could not fly properly; he seemed very young and his feathers were rather bedraggled. He took a look at the Ravi Varma print on the wall and cawed indignantly (was he unhappy because we don’t have an original?) 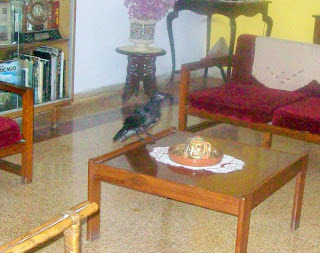 and flew on to the fan, flapping his wings, and then flew out, encouraged by my mother. She said if we did not shoosh him out, a whole lot of crows would come in looking for their lost member. I rather like these young creatures (it was the squirrel last month) checking out our rooms! MY HALF-INCH OF FAME. . .
Andy Warhol said everyone gets his 15 minutes of fame; I got my half-inch today. And my mother a little bit more. Good friend Meera called me this morning when I was in the middle of cooking breakfast. She said, “Hey Raji, did you know your blog is mentioned in Indulge Express today?” This is the Friday supplement of the New Indian Express. Meera’s blog had been mentioned a few weeks ago here. Breakfast was dropped midway. After thanking her, we rushed to get a couple of copies of the Express. And there it was in the supplement, tucked away in one of the inner pages, a piece on senior bloggers. 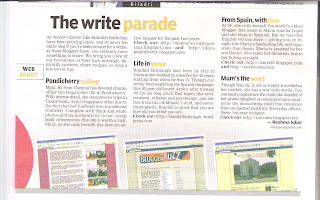 There was my mother’s blog mentioned in the first para. It even had the picture of her home page. And mine was the one in the last para. I was pleased, if not totally surprised. Only earlier this week, someone from Indulge had mailed me telling me that they had come upon my blog and would like to feature it in a piece on senior bloggers. And sorry for asking, but how old was I. I sent off a reply with the right age, telling them that I was old enough not to mind being asked. 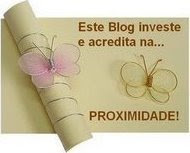 And mentioning that my mother is also a blogger, gave them her blog’s addresses. But how they got to me in the first place, I don't know. 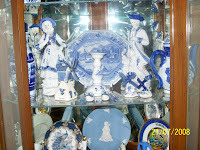 But with other friends calling and mailing to say they had read about us oldies in the Indulge, we were back to elation.